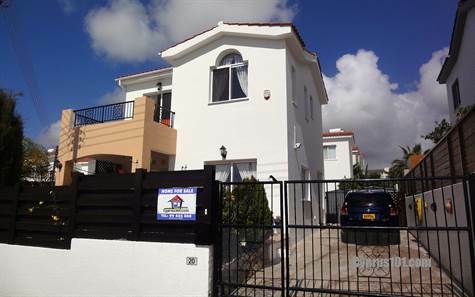 Tala, Paphos - This immaculately presented 3 bedroom detached villa is located on a corner plot in a quiet residential area within easy walking distance to the local amenities of Tala, including a lively village square with a good variety of restaurants and tavernas. The ground floor features an open plan living room nicely divided into a comfortable lounge, spacious dining area and corner kitchen with breakfast bar. There is a guest cloakroom to the side of the marble staircase. There are patio doors and windows on all sides providing lots of natural light and easy access to a raised covered veranda and private barbacue area. The kitchen is well equipped with white fitted units and granite worktops and includes a built-in oven, electric hob and extractor fan, fridge/freezer, dishwasher and washing machine. Upstairs, there are three double size bedrooms, all with plenty of fitted wardrobes. The master bedroom has an en-suite shower room and there is a modern family size bathroom accessed directly from the landing. Both the master and second bedroom have easy access to a large balcony with lovely coastal/rural views. Outside, the garden has been designed with easy maintenance in mind. To the front the gardens are ablaze with colourful potted plants and to the side is a private enclosed garden with gazebo, fitted barbecue and 9 x 4 swimming pool including roman steps for easy access. The long driveway can easily accommodate 3 cars and there is a useful storage space to the rear. The property is in a sought after location and is in excellent condition with good quality finishes throughout. Furniture can be included if required and there are full title deeds. Please refer to MLS#: 1336 when inquiring.